CHICKEN BROTH (WATER, CHICKEN STOCK), CREAM (MILK), SEASONED CHICKEN, RICE, MUSHROOM (BUTTON AND PORTOBELLO), RED AND GREEN BELL PEPPERS, CANOLA AND/OR SOYBEAN OIL, DICED TOMATOES (TOMATOES, TOMATO JUICE, CITRIC ACID, CALCIUM CHLORIDE), MODIFIED CORN STARCH, SALT, WHEAT FLOUR, SUGAR, TOMATO PASTE, WORCESTERSHIRE SAUCE (DISTILLED VINEGAR, MOLASSES, WATER, SUGAR, ONIONS, ANCHOVIES, SALT, GARLIC, TAMARIND EXTRACT, SPICES, FLAVOUR), YEAST EXTRACT (BARLEY), BEEF GELATIN, BASIL, CILANTRO, GARLIC PURÉE (GARLIC, CITRIC ACID), SOY SAUCE(WATER, WHEAT, SOYBEANS, SALT), MALT VINEGAR, DRIED GARLIC, SOY PROTEIN ISOLATE, ONION POWDER,SPICE EXTRACTS (CONTAIN CELERY), SPICE, FLAVOURS, PAPRIKA EXTRACT. This product has not been fully cooked before freezing. Carefully follow the recommended cooking directions to assure complete cooking.1. From a frozen or thawed state, immerse pouch in boiling water 2. Heat product until 80º C / 180º F3. Using a ladle or insulated gloves, remove pouch from water4. Open Pouch: Make a cut with a knife near top of pouch. Carefully pour into steam table insert or holding kettle. Do not add water or milk. Keep frozen until ready to use. Ready to Cook. Do not re-freeze. Do not use if pouch punctured or torn. 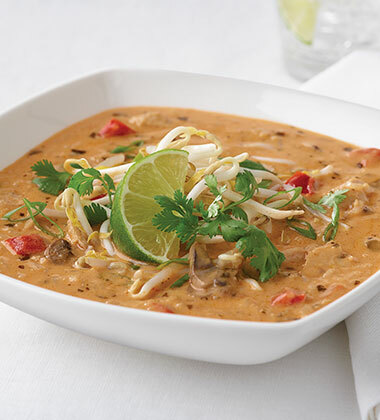 This exotic Asian chowder is alive with bold flavours and needs only simple garnishes to impress your patrons!